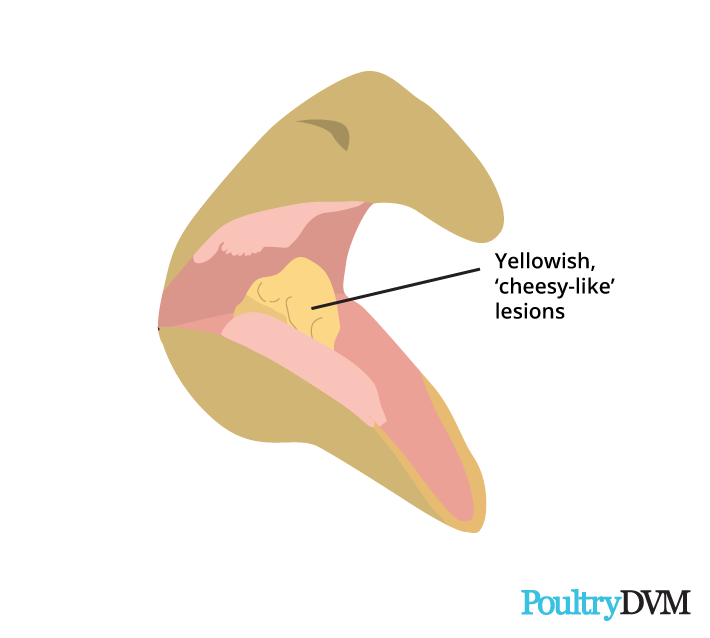 Avian trichomonosis, commonly referred to as 'canker', is a protozoan infection characterized by the onset of 'cankerous'-like, caseous plaques inside the chicken's mouth. The disease is caused by Trichomonas gallinae, a flagellate protozoa commonly found in pigeons and doves. The severity of the infection varies depending on the strain of T. gallinae, immune status of the bird, and their age. There are numerous strains of T. gallinae, ranging from some which cause no clinical signs to highly pathogenic strains. Younger birds are usually more seriously affected than older, mature birds. Columbiformes are the most common host of T. gallinae, with most wild and almost all domestic pigeons and doves being infected. It is estimated that approximately 80-90% of adult pigeons are infected with T. gallinae, many of which may never show clinical signs of disease. Over the past several years, there has been an increasing number of T. gallinae infections reported in chickens, turkeys, raptors, and songbirds (passerines). Early signs of infection include the appearance of small, hard, well-defined, cream to yellowish sores that are stuck to the side and/or roof of the oral cavity, tongue, edges of the beak, and occasionally covering the glottis. As the disease progresses, these sores increase in size and thickness, and become caseous ('cheese-like') in appearance. Sores are usually found inside the chicken's mouth, but can also develop on the beak exterior and near the eyes (where it might be confused with fowl pox). Other non specific signs observed include huddling, listlessness, ruffled feathers, and depression. Oral sores that develop inside the bird's mouth are usually easy to see by gently opening the bird's beak and looking inside. Sores can develop in the chicken's esophagus or throat can potentially block air passage and impact the bird's ability to swallow. This may initially present as reduced feed and water intake and leading to weight loss. Throat sores can also potentially close off the windpipe, causing the bird to suffocate. In other cases, the disease can progress to a lethal systemic infection, spreading throughout the body. If sores invade the roof of the mouth (oropharyngeal cavity) and sinuses, they can potentially penetrate through the base of the chicken's skull and into the brain. Chickens become infected with T. gallinae by drinking or eating from contaminated sources. Water or feed becomes contaminated when infected birds drink or eat from it, usually domestic or wild pigeons or doves, but an increasing number of other wild bird species have been confirmed hosts recently as well. T. gallinae can also be transmitted between adult chickens during courtship behavior. T. gallinae can remain infectious for at least 5 days in moist grains and from 20 minutes to several hours in water. Adult chickens that recover from canker may still carry the parasite, but are resistant to reinfection. Oral lesion appearance Patches of raised, whitish, dead epithelial debris. The top white pseudomembranes can be wiped off. Sticky, yellowish-white 'canker-like' masses of caseous, necrotic material. More likely to occur following Prolonged antibiotic therapy, concurrent disease, infestation with internal or external parasites, or stressful event. Pigeons and doves sharing the same water or feed source. History - of pigeons and doves drinking or eating from the same sources as chickens. Word of Caution Removal of affected tissue from the chicken's mouth or throat is not recommended unless in cases where the bird can't breath or swallow, as it promotes invasion by pathogens leading to secondary bacterial infections. Berimax A highly effective alkaloid nutraceutical derived from purified plant extracts by a Norwegian veterinarian. Don't allow doves or pigeons access to the chicken feeders and waterers. Provide apple cedar vinegar in drinking water (1 tablespoon per gallon (15 ml per 4 L) periodically (once a month or so). Where chickens are frequently visited by wild birds, add acidified copper sulfate (powdered bluestone) solution to drinking water once a month for a duration of 3 days. Usually younger chickens are more susceptible to infection. Pigeons and doves drinking or eating from the same water or feed source.